Taylor Downing takes a look at how 1960s Hollywood dealt with one of the most important days of the Second World War. ‘Hollywood meets D-Day’ is probably the best way to describe the all-star spectacular The Longest Day released in 1962. Most of the key players in early 1960s Hollywood competed to be in the movie, including Robert Mitchum, Henry Fonda, Rod Steiger, Robert Wagner, George Segal, Robert Ryan, and John Wayne. The stars of the British cinema also lined up to appear including Kenneth More, Richard Todd, Leslie Philips, and Sean Connery – playing his last movie role before being cast as James Bond. Richard Burton, who was waiting to film Cleopatra, begged to be in the film and was given two small cameo scenes which he performed without payment. Several leading German and French actors also appeared. Many individuals, American, British, German, and French whose story is told in the film, from generals to junior officers, acted as consultants to advise on historical accuracy. Even Dwight D Eisenhower, the Supreme Commander of Operation Overlord who had been President of the United States for eight years, offered to appear as himself but the film makers thought it would be too difficult to make him look as he had been in 1944 and so his part was played by an unknown lookalike. Made only 18 years after D-Day, the film makers were also able to utilise plenty of technology that had been used in the invasion itself making for some great spectacle. So with all these stellar ingredients it’s a shame that the film has not aged well, that many of the performances are clumsy and unconvincing and that it has been superseded by other films, most notably Saving Private Ryan (Steven Spielberg, 1998) and Band of Brothers (Spielberg and Tom Hanks, 2001). 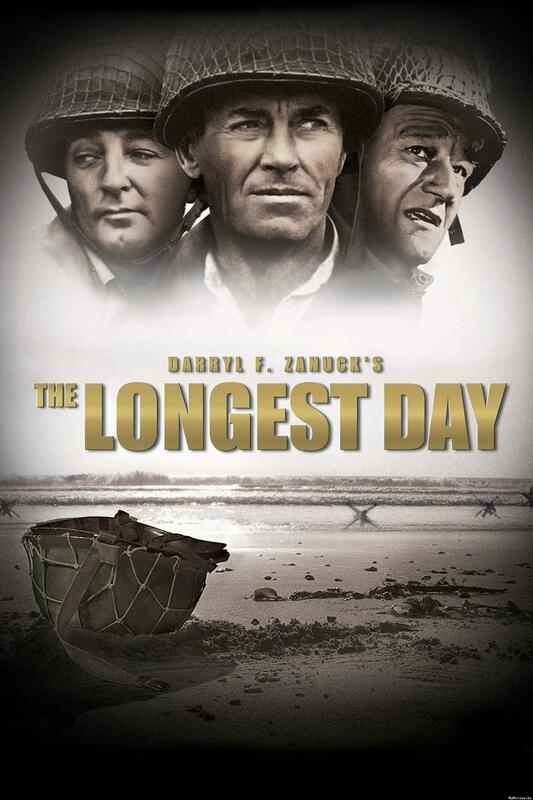 The key mover behind The Longest Day was the legendary Hollywood executive, Darryl F Zanuck, the man who had founded Twentieth Century Fox in the mid 1930s. Zanuck had a real flair for what would succeed at the box office and had produced several historical dramas including Young Mr Lincoln in 1939 and a film in which he had invested an enormous amount of energy, commitment and investment, Wilson, about the President who had led a reluctant America into the First World War. Having split from his wife in the mid-1950s in a mid-life crisis, Zanuck had been out of Hollywood for five years when in 1960 he paid the then huge sum of $175,000 for the film rights to the book The Longest Day by ex-war reporter Cornelius Ryan. Making the film was Zannuck’s comeback to Hollywood and to Twentieth Century Fox. He saw the project in epic terms – as big and ambitious as was the invasion of Europe itself. 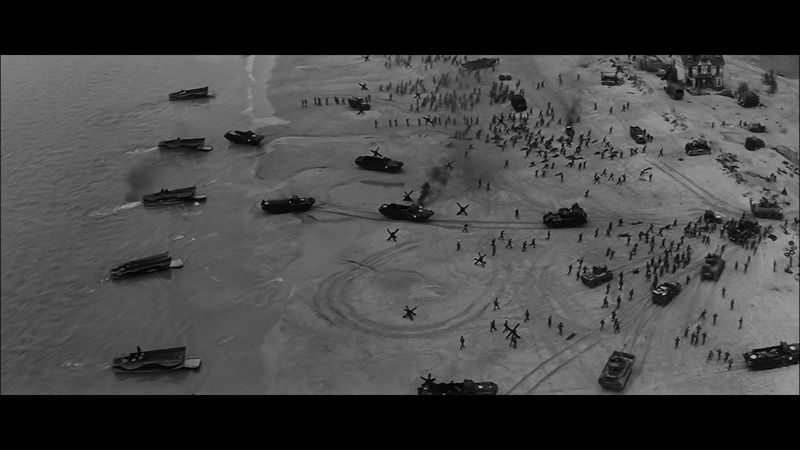 He wanted it shot in black and white to look realistic and like most of the archive film of the war. His aim was to show the story from all sides, so there are plenty of Brits alongside the Americans (unlike in Saving Private Ryan where you could be forgiven for not knowing that the British had taken part in D-Day). Much of the film is devoted to the German side of the story, and the heroic role played by the French resistance and by French commandos is also strongly portrayed. For the original version all the Germans speak in German, the French in French, and everything is subtitled which was extremely rare in American films. However, the German and French scenes were also shot in English and later versions of the film (and the film’s original trailer) used the English language dialogue. The film was shot in Zannuck’s favourite format, widescreen CinemaScope. Three separate directors were employed. Four writers worked with Ryan on the script. And the film has a catchy title theme written by Paul Anka who also plays an American ranger. Much of the first 20 minutes of the film is from the German side. Field Marshall von Rundstedt (played by Paul Hartmann) reviews German troops. Rommel (Werner Hinz) inspects a coastal battery and demands more defences along the beach. He makes it clear to his subordinates that he wants to defeat the invasion, when it comes, on the beaches, and that the first 24 hours will be vital for both the Allies and the Germans,. It will be ‘the longest day’. The rest of the action takes place in the couple of days prior to and during 6 June 1944. By the time the film jumps to ‘one of 1108 camps’ in England the rain is lashing down. The spring of 1944 had been warm and sunny but an unseasonably bad low pressure had come in on 4 June making the Channel choppy and wild, and the planned invasion is postponed by 24 hours. The film dwells on the discomfort of the troops and the difficulty of keeping so many men on the ball, waiting to go. Colonel Benjamin Vandervoot, commander of the 2/505th battalion of the 82nd Airborne (John Wayne) complains that ‘three million men are waiting, all keyed up.’ General Norman Cota of the 29th Division (Robert Mitchum) says ‘Ike can’t call it off again. There are 4,000 ships and 12,000 aircraft ready…I say ‘go’ – weather or no weather’. Meanwhile the soldiers wile away the time gambling and one wins a fortune of $2,500. There is the first of several dramatic tracking shots as the camera moves through a vast barracks packed with GIs. This film will be about the men, the huge numbers of them, assembled in southern England for the most ambitious operation of the war. The film then follows the episode in which Group Captain Stagg (Patrick Barr) spots a break in the weather coming in from the Atlantic. He is called to a briefing at Eisenhower’s headquarters. Eisenhower had described the scene in his memoirs Crusade in Europe published in 1948. After hearing Snagg’s report he sums up the options. ‘We go on the 6th with marginal conditions or we postpone again’. Eisenhower went around the table asking for opinions. In the film we just hear Monty (Trevor Reid) recommending to ‘go’, as he did in actuality, and Air Marshall Sir Arthur Tedder (Louis Mounier), Eisenhower’s second in command for Overlord, explaining that the next time the tides and moon will be right will be in mid July. It all comes back to Eisenhower, played by Henry Grace, a stage hand who looked eerily like the American general. The Supreme Commander had to make the biggest decision of his life. After barely a moment’s hesitation, Eisenhower says, ‘Gentlemen, we can’t do anything but go.’ Rarely are historic decisions as dramatic as this. Other senior officers prepare to depart for a day of war gaming in Rennes. The weather had been a nuisance but the fact that it seemed so unlikely to the Germans that the Allies would invade in such conditions gave a huge boost to the invasion by taking so many of the key German players away from the scene of action for the critical few hours on the morning of 6 June. Vandervoort briefs his battalion on the use of the cricket, a simple clicker device, one click to indicate where you were, to be followed by two clicks by any other paratrooper who heard it. After the dramatic story of the capture of Pegasus bridge, the film moves on to the story of St Mere Eglise, the small French town that would be immortalised by the events of the night before D-Day. The American pathfinder paras jumped over the town at about midnight. The first paratrooper to land in occupied France was later thought to be 19 year-old Private Bob Murphy of the 505th. He landed in the garden of the local school teacher, a spinster who came out to see what all the noise was about. As Murphy, his face blacked up, climbed out of the bushes he looked at the startled teacher, put his fingers to his lips to signify silence, and then disappeared into the night. He could have dropped from another planet as far as the teacher was concerned. Although the pathfinders were dropped precisely on target, when the bulk of the American para force came over in their C-47 transports two hours later, the anti-aircraft fire caused many of the inexperienced pilots to lose their place in the vast aerial armada. Panicking, many pilots gave the green-light jump signal too early or too late. As a consequence the American paratroopers were dropped over a vast area that night. A tiny number landed in or around the main square of St Mere Eglise that had been lit up by a fire caused by a tracer shell from the anti-aircraft guns. This story becomes a major part of The Longest Day as the Germans on the ground pick off the descending paras when they were most vulnerable. Some land in trees. One para, Private John Steele (played by Red Buttons), lands on the church tower and is suspended by his harness. 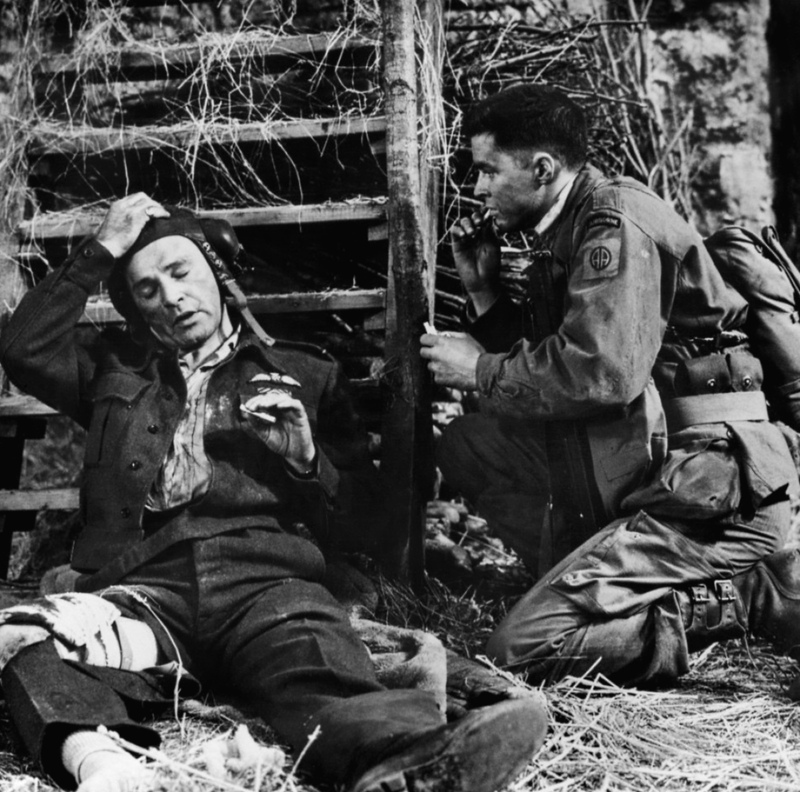 In fact, only about 20 American paras landed in St Mere Eglise and at least half of them, including Steele, were captured. But in the movie it looks like half the para force land on the town and are wiped out. Partly as a consequence of the film, St Mere Eglise has become a centre of pilgrimage for Americans visiting Normandy and the church tower has a white parachute permanently tied across it in tribute. With the German commanders trying to understand what is happening, Major Werner Pluskat (Hans Christian Blech) is woken and sent to his bunker on the coast to report back. Pluskat was one of the many advisers to the film makers and his story offers one of the best shots in the movie. Having seen nothing all night, he looks out to sea one last time through his binoculars and the mist clears to reveal hundreds of ships filling the dawn horizon. He reports back to his command HQ that there are 5,000 ships approaching the beach but is laughed at by the armchair general who says, ‘Don’t be silly, the Allies don’t have 5,000 ships’. At that moment the naval bombardment begins. The landings on the next beach eastwards, Omaha, turned into a famous massacre. Well trained German troops firing from well sited machine gun nests held up the Americans for most of the morning causing dreadful loss of life. Using the famous photographs taken by Robert Capa during the actual landings as a guide, the movie shows men sheltering behind steel obstacles, and slowly gathering under the sea wall. These scenes are very powerful. Pinned down and suffering heavy losses, General Norman Cota (another of the consultants to the film) provided extraordinary leadership and rallied the men of the 29th Division, destroying the German wire and leading a group of them up a gully to the cliff tops. Once there they were able to fan out and attack the German defenders. The day was turned. In a bravura performance, Robert Mitchum strides up and down the beach, encouraging his men, shouting orders and smoking cigar after cigar. Cota was one of the real heroes of D-Day and Mitchum does justice to his heroism. In another story of great courage a group of specially trained US rangers ascend the cliffs at Pointe-du-Hoc under fire in order to take out a set of heavy guns located on the cliff tops. When they had fought their way up the cliffs they found that the giant casemates were empty. 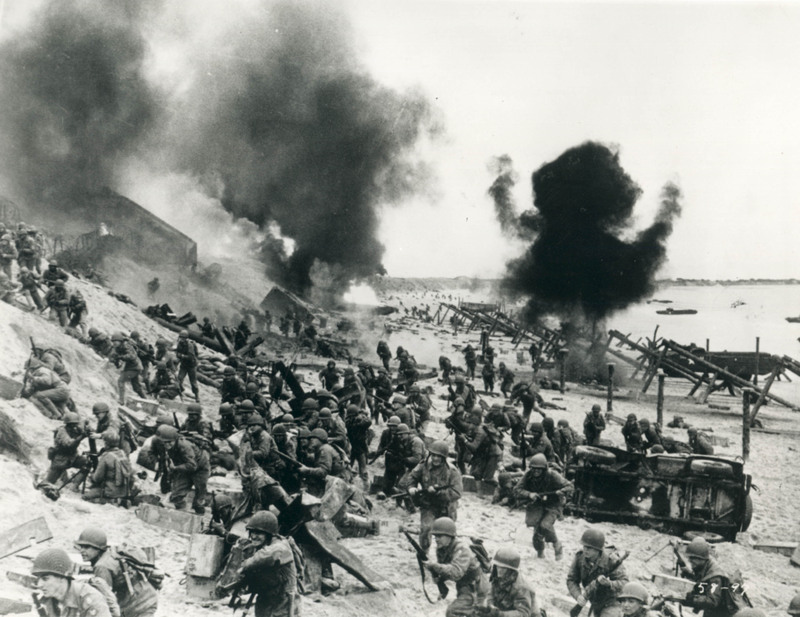 Although it is not made clear in the film, the 155mm guns that could have fired onto both Utah and Omaha beaches had been recently moved because of the heavy bombing of the site. Meanwhile, thousands of American paras are spread out across the French countryside, hopelessly adrift of their drop zones and lost. Colonel Vandervoort has sprained his ankle on landing but, carried in a hand cart, gathers whatever men he can find. John Wayne performs this role as though in a Western and every time he finds a few more men gives the order ‘Move ‘em out’ as though he was addressing the US cavalry after having defeated the Red Indians. Despite this wooden performance, the sense of chaos among the scattered American paratroopers is well captured in the film. On the British and Canadian beaches further east the landings were largely successful. The film shows Lord Lovat (Peter Lawford) leading his commandos ashore with Piper Bill Millin playing the bagpipes. On Sword Beach the major problem was traffic jams as so many vehicles had got onto the beaches but could not find the route inland. Kenneth Moore plays a rather improbable beach master, Captain Maud, with a bulldog called Winston trying to direct trucks and tanks off the beach. The film captures the sense of frustration among the German commanders. After a dispute over whether to locate their panzer units near to the beaches (as Rommel wanted) or further inland (as von Rundstedt wanted), Hitler had taken personal control. The panzers could only be moved on his orders. And on the morning of 6 June he was sleeping late, having taken a sleeping pill the night before. In probably the greatest blunder committed by the Germans on D-Day, the panzers were left waiting and took no part in the battle. As one general says, ‘This is a historical moment. We will lose the war because the Fuhrer has taken a sleeping pill.’ Even after he woke, Hitler refused to move them, convinced that the landings in Normandy were a diversion to the main assault that was still to come along the Pas de Calais. Meanwhile, according to the film, the Luftwaffe are down to two aircraft and Wing Commander ‘Pips’ Priller (Heinz Reincke) leads the single air attack that day on the beach at Omaha. It is a spectacular piece of filming with hundreds of extras scattering as the FW-190s fly along Omaha beach. There is a lot to respect about The Longest Day. It is made with a faithful attention to detail. Its spectacle is truly spectacular. But it belongs to that era of 1960s film making when combat scenes were so totally unreal. Hundreds of stunt men leap in all directions as shells land and bullets are fired. But there are no mutilated bodies and certainly no body parts. Everyone is killed cleanly and instantly. The wounded never groan or call out in agony. The film is based on accurate individual stories and repeats many of the words and phrases actually spoken on the day. The locations look authentic and convincing. But the plethora of big names makes watching the film like an exercise in star-spotting. And the very realism the film claims to offer is undermined by the hopeless lack of realism in the combat scenes that are at the heart of the film. It was at least another ten years before Hollywood would truthfully portray the horrors of war. I doubt Lovat would have spoken about Britain as England as in the film. Shame on these film makers for leaving out our landings at Juno Beach! Does anyone know where you can get the English language version;it definitely contains scenes not in the current dvd/Blu-ray versions. A good book by Cornelious Ryan, a bad film on so many levels, over aged, overpaid lead actors; questionable production values, and every thing that was wrong with Daryl Zanuck.